American artist Elizabeth Busch (70), who works and lives in Maine, the Pine Tree State in the northernmost part of the region New England (USA), about 5 hours from the Canadian border, is a multifaceted designer in different disciplines of art. Awarded for art quilt in Japan (2003) and for excellence in surface design (2005, New York), she can look back upon a rich artistic career. She likes to combine art disciplines and to make combinations of different materials. She draws, paints, sews, sculpts and decorates rooms with kinetic sculptures and art quilt. 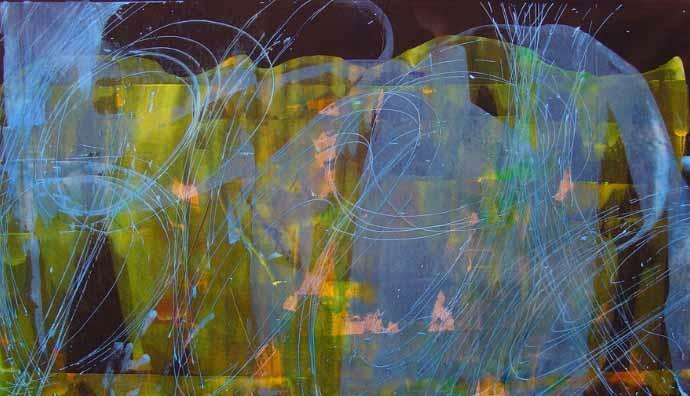 It is movement that intrigues the dynamic artist, who values her environment as a crucial influence in her work. "I work in two special disciplines of art," Elizabeth explains, "kinetic sculpture and art quillt. And I also make a lot of atmospheric paintings. In each of my artworks the process of creating is crucial. Key factors are layering, spatial illusion, landscape and movement. The play of large scale and intimacy is interesting for me. My work is also autobiographical. However, when I start painting, I don't have anything in mind. For whatever reason, my paintings always come out as landscapes." Elizabeth Busch has made a number of atmospheric paintings of landscapes in the winter of 2013. These paintings are interpretations of other times and places. Each image is painted with textile paint on black 'Trigger' cloth. The larger rectangular paintings are all approximately 30” x 54,” the smaller pieces approximately 30” x 35.” 'Trigger' is a fabric type manufactured of polyester and cotton. It comes in several different colours, has great strength and durability. Elizabeth: "I like to use it because it is very stable, it does not stretch and shrink, it hangs nicely and does not sag or warp, and it is also a nice surface to paint on. Each of my paintings is a visual conversation between me and my materials. I do not know what the conversation will be before it begins, I simply engage with the materials when it’s time. Since I am in a different place every second of my life, I trust that the transference of energy may connect with me wherever I am at the moment. Memories of time and place reveal themselves in colour, movement and texture in this series of work." Elizabeth usually paints with special textile paint on black fabric. Many of the other paintings were painted on a black background. Elizabeth: "I make my paintings on black polyester or black canvas. I just like those surfaces for my paintings. I choose black as a background, because it makes the colours pop in a different way. It has a very different and dramatic effect, as opposed to a background of white fabric. The interplay of colours, caused by using a black background, is what I really like." "I have been an artist all my life"
At the age of 17 Elizabeth Busch went to study at the well-known Rhode Island School of Design, founded in 1877, one of the oldest and best-known colleges of art and design in the USA. Each year approximately 2,300 students from around the world pursue a creative, studio-based education at the famous college, based in Providence, Rhode Island, which offers its own vibrant art scene. Elizabeth studied the art of painting for four years in Rhode Island. "It was a famous art school in Rhode Island, they taught us a lot, like different kinds of drawing, we learned figure drawing, mature drawing, and drawing small objects, like shells and rocks. We also were taught how to make two- and three-dimensional designs." At the age of 19 I started working for an architectural firm in Bangor, Maine. I have been working there for 18 years. I thought that the architect who hired me wanted me to draw some kind of art, but the first day I started working for him I had to draw a plumbing system for a motel. I had never drawn technical things, but I did it and it was very interesting. The architect who had hired me apparently had seen in my portfolio that I could do it, that I had no trouble with envisioning space. He could see that understood the technical approach of space. He saw that I could design and arrange pipes, and it just grew from there. I collaborated with the other architects and engineers in designing hotels, schools, office buildings etc. and later when I worked independently as an artist, this experience appeared to be very useful, when I started working with kinetic art. One of the most important things in kinetic art is that you understand a space and for example know in what type of building you must apply what kind of colours and materials. All depends on the type of building and its visitors." One of the main disciplines in Elizabeth's artwork is kinetic sculpture, mobiles that rotate gently in the currents of air in a room or the movement of the air as people walk by. Most of her kinetic sculptures are made of acetate sheeting painted with acrylic paints, mica powder, metal leaf and mylar film. These colourful objects are usually suspended from the ceiling or skylight by means of col-formed steel brackets and aircraft cable. They are mounted on swivels so that they turn continuously ikn the air currents in the room, transmitting or reflecting direct sunlight , light from the lamps in the room and light reflected from surfaces such as floors and walls to give a continually changing colourful kaleidoscopic display. In the absence of transmitted light, the sculptures become brightly coloured jewel boxes in their own right. Elizabeth Busch describes the process that she went through when making Frontier Spirit (photo right and below) for a school in Alaska. "First I tried to imagine what I think should be in this space. I wanted things to move,to be colourful and hanging. 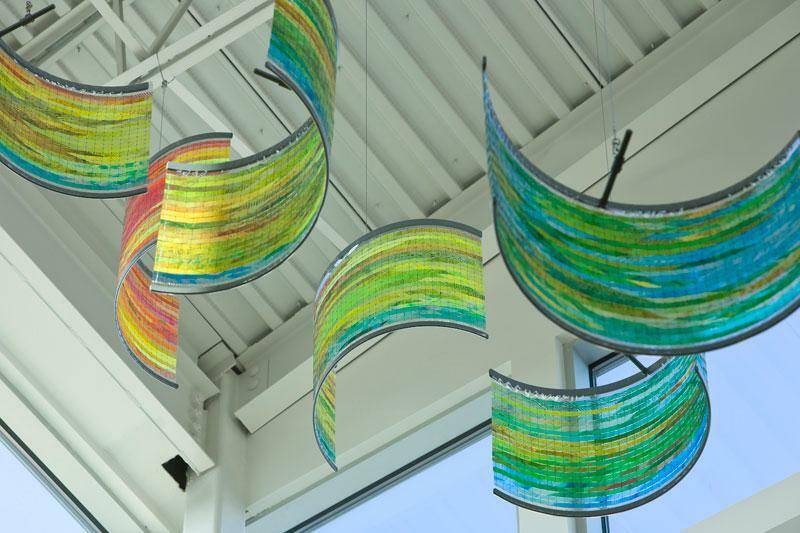 This is a permanent installation, a kinetic sculpture, in curves, painted on thin acetate. Some of the pieces permantly move. Those are all pieces hanging together, when you would stretch them all out, they would be 150 feet. The artwork hangs in the reception and corridor area in a school. It was a competition with 200 competitors, which I won. The material is painted acetate (a kind of transparent plastic), mounted on steel supports. Acetate is a very thin sheet of plastic. It is also very pliable, because it has the weight of paper. That is how I created the curves." 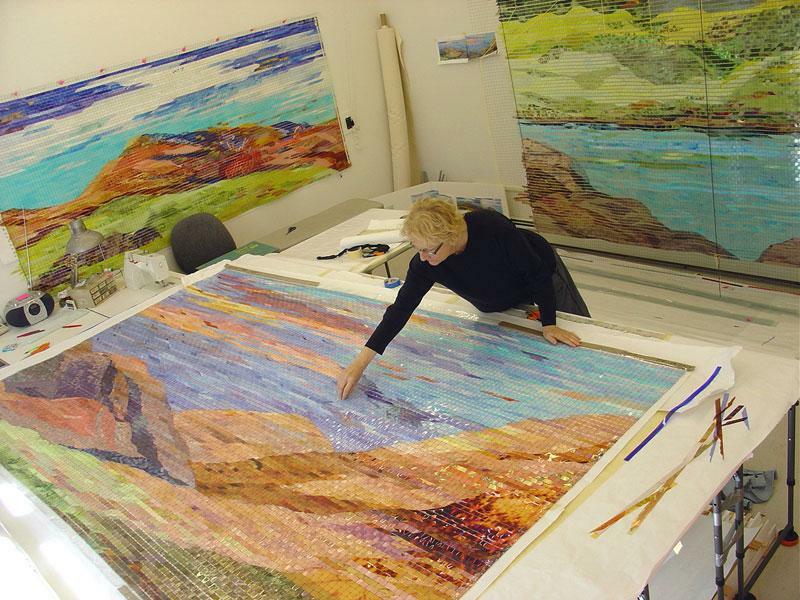 Elizabeth paints the sheets and then cuts them into strips, which are woven in a netting and then suspended, thus making of the landscape a beautiful, moving imagery. The strips are separate and only 24 inches long and hung down from the ceiling. Elizabeth Biusch:"It took me 7 months to make this artwork. It is so enjoyable, it is pure pleasure. I love it, it is extremely satisfying. The most satisfying part about it is the response from the people that use the space. The children, the teachers, the community that comes in. Some of the pieces are moving, because of the warm air rising, and the cool air falling from above and because of the moving people. So it all makes the artwork move very gently." Kinetic art is very special, you don't often see moving art in public spaces. And the interplay of colours make it even more beautiful. Elizabeth:" The pieces that have a double curve, don't move and the pieces that have a single curve, they move. I wanted to create a dynamic atmosphere. It is not always moving and fusing, but there is a stable continuous flow, all the way down to the corridor." 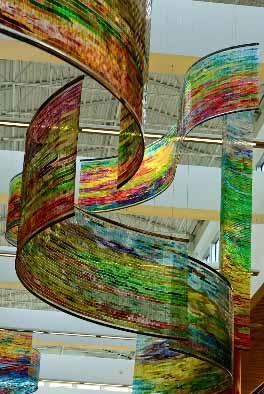 The artwork 'Outside, Inside' of Elizabeth Busch, consisting of 11 painted sections, is 65 feet long and hangs in the lobby to the public area of a 3-storey laboratory in Albuquerque, New Mexico. Constructed of painted and woven UV acetate, the artwork 'Outside, Inside', incorporates an abstract imagery that refers to the colours of the earth and the sky of New Mexico, the Rio Grande and the Sandia mountains. 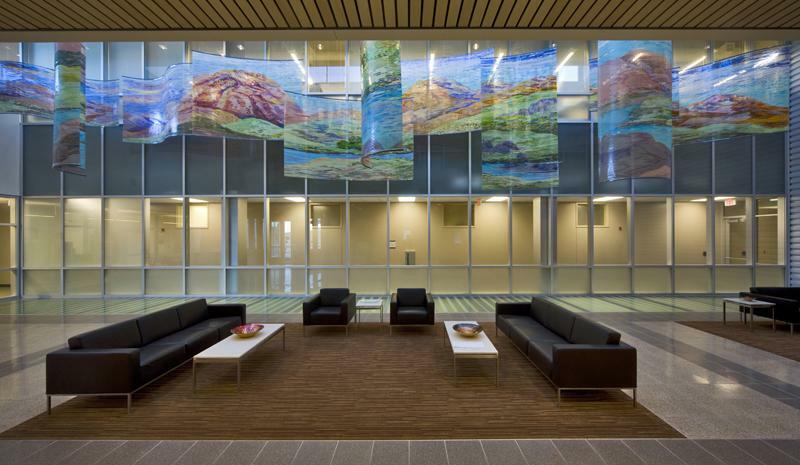 The group of eleven suspended panels enlivens the lobby of New Mexico Scientific Laboratories in Albuquerque. 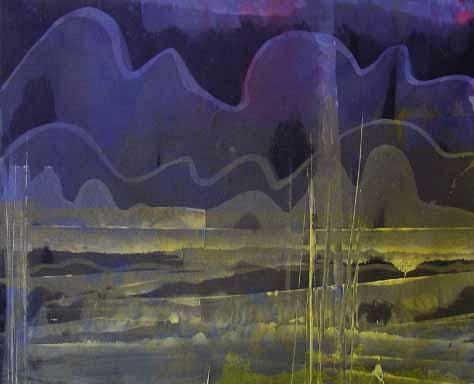 At first glance, visitors and employees of the laboratory are drawn to the colourful, undulating landscape overhead. Upon closer inspection the viewer sees image fragments of microscopic cells that are hidden within the composition, thus creating the dichotomy between 'the outside' and 'the inside' landscapes. Elizabeth enthuses: "The artwork Outside - Inside' is installed in an important scientific laboratory. There my architectural experience proved to be very useful. That was a huge advantage. Working for that architect had a major influence in my career. For example I learned how to read architectural drawings and to envision space. With regard to colours I learned to apply the right colours in the right place. Colours are very important for the people that are using the space. For example these colours in the school, wouldn't work in a hospital. So the space and the people using the space determine what solution you have to come up with. When talking abot forms, 'Outside - Inside' is an undulating landscape, just like the artwork in Alaska. I think the most important thing I learned from this architect, Eaton Tarbell, was creating an emotional experience. Different colours have different emotions and different impacts to the people who are viewing them. In 1989 I made my first kinetic sculpture. After I had done a large quilt commission in a hospital in Texas I saw a large artwork, a painting with quilt, 22 feet long. And I liked it, because I like working big. After that I started making those big wall sheets hanging, kinetic sculpture. 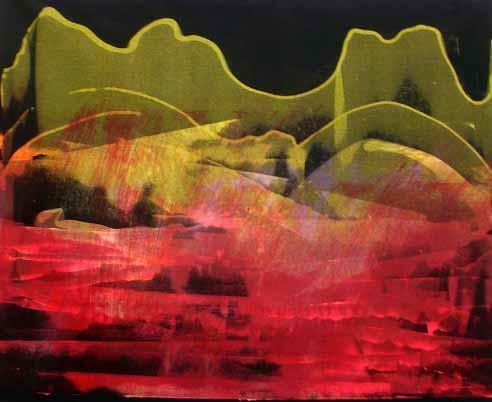 In the artwork in New Mexico, 'Outside - Inside', I managed to incorporate imprinted strips with cells of blood and diseases, like cells of a plague, and also plant cells. So you see a landscape, but in the landscape you recognize the cells that the laboratory technicians are working with." In this way Elizabeth Busch managed to combine artistry with science by integrating prints of cells, normally used in the laboratory to work on diseases. Just like in the project in Alaska, the colours are reflected on the walls and floors in this project as well. In her studio the landscape hangs on a roll work, close to the wall, and can be raised and lowered. It is like a giant window shade. Elizabeth: "It is very labour-intensive work, but I love doing it. I think you can compare it with tapestry, as opposed to painting. In this way I compose my own tapestry and by the whole process I am refining my own artwork." With her project 'Outside - Inside' Elizabeth Busch won a national public art competition from the state of New Mexico. On the photo above she is checking the last units and adding final touches to the three panels before the sewing process starts. All the eleven panels had to be absolutely squared before the edges got sewn. Elizabeth: "All of my artwork and the steel armatures were shipped from my studio in Maine to the Lab in Albuquerque for installation." "The universal language of Art Quilt"
Art Quilt by Elizabeth Busch: Gateway to the South, Fort Lauderdale, Hollywood Airport (1990). A third, very important art discipline of Elizabeth Busch is quilt making. Elizabeth started making art quilt, as she remembers, when her children grew up and stopped needing the cloth animals that young children often cherish and put besides their pillow before going to sleep. Elizabeth: "At a certain moment, somewhere in 1983, I stopped making animals out of cloth for my daughter, and I started making art quilt. First I made a painting on canvas as a kind of tapestry to hang on the wall and look at. And I liked both the result and the process of art quilting. I had a painting that I had done on canvas with acrylics, but I cut it up, because I didn't like it. The name art quilt did not even exist in those days. After I cut it up, I saw it was a fabric, and I started to sew it together with other patches. I really like to cut a work of art into pieces and to make a totally different artwork out of it. I have been doing it for 20 years now. I received twice an award for my art quilt, once in Japan in 2003, I got the Quilts Japan Award for Quilt National that year, and in the Schweinfurth Memorial Art Centre in Auburn, New York, I got an award for excellence in surface design (2005), with my art quilt. I give a lot of workshops in art quilting as well in the USA and around the world. I was also chosen the best art quilter in a show for Quilt National in 1989, a biennal exhibition of art quilters in Ohio. That work now hangs in a museum. I have been teaching and exhibiting internationally in art quilts." My art quilts are sewn paintings, acrylic on canvas that is then hand quilted. This part of the process allows me to become physically reacquainted with a piece created at arm's length on the wall, and to add another visual dimension to it. I believe that the work communicates with many people because colour and mark making are a universal language."